Polar bears have a range of vocalizations but they are no noisy animals. Icy bears remain quiet and live solitary lives most of the time. 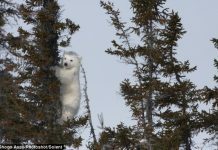 However polar bears’ sounds are heard either during mating season when males attempt to convince its mating partner or when the individuals fight each other. Mature male bears produce sounds in order to show aggression either before the fight or during fighting. Prominent among the aggressive sounds is chuffing which is not heard when bears are in good mood. Thus the chuffing sound suggests that the polar bear is not in a good mood at all. They never make chuffing sound while playing. 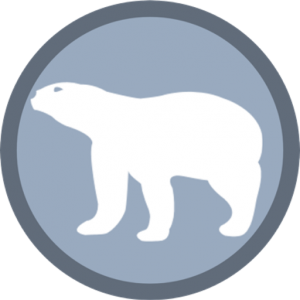 Do you want to know what sound does a polar bear make in tundra? What Does a Polar Bear Sound Like? Icy bears are thought to produce as many as 3 to 6 different sounds. Each sound shows different behavior of an animal. 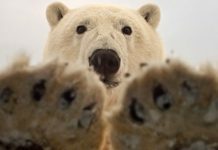 The polar bear’s sounds include moaning, jaw-chopping, growling, blowing, hissing, whimpering, throaty rumblings, braying, squalling, smacking, roaring, and finally chuffing. 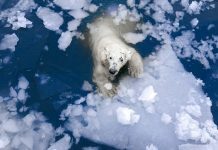 If you come across a vocal polar bear you’ll notice that she might sound like a tiger or a lion when she roars. The roaring sound is not as clear though but it is good enough to give the impression of a tiger. Sometimes ice bears appear to sound like elephants. The sound roaring is sometimes is a call of excitement as most bears roar when they are in a fairly good mood. Aggressive calls include jaw-chopping and growling. What does a Polar Bear Sound when she is Angry? Polar bears make a repeated call of chuffing when they are angry. While they often avoid fighting and walk away the mother bear produces chuffing sound when she must defend her cubs against an intruder. 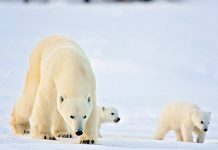 Male polar bears regularly show strength to the outsider male but they do not do so in order to defend cubs. They will leave mother and cubs soon after mating. 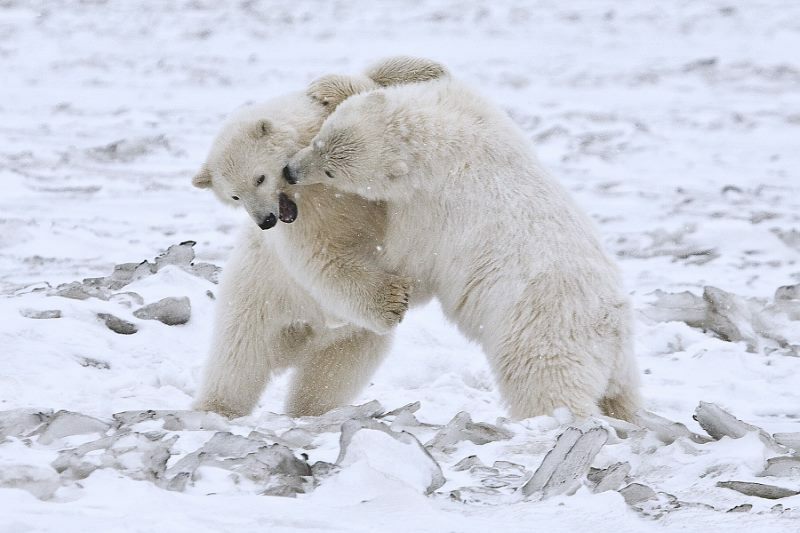 Male bears often fight to win over their mating partner. That is why the chuffing sound is typically heard in the mating season rarely in regular days. They will produce a chuffing sound with open mouth. Since they utter same chuffing sound in different situations it depends on the context as to what polar bears want to say. Studies suggest that adults also utter chuff sound when they are in distress. It’s like a ‘mayday’ call. While bears mostly live alone sometimes polar bears live in groups. If one of the group members get separated then she might utter a repeated call of chuffing. When do Female Polar Bears produce a Chuffing call? Female bears become more vocal in the first 120 days when they emerge out of their maternity dens. They do so in order to drive out all sorts of threats from her cubs. 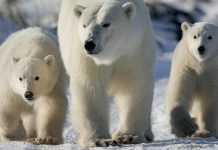 Unlike adult males female polar bears are devoted mother and they will actively respond to the distress call of their babies. The call is greatest when cubs are only few days old in age. 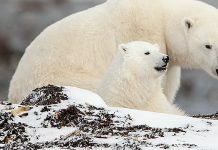 However as the polar bear babies become 3 – 4 months old the mother produces call but only sometimes. The mother bear is also likely to chuff when she plays with her cubs. Sometimes she sniffs, or rubs her muzzle against her cubs, or when she bites and paws. She may utter the same chuff sound during all these actions. Similarly, if a mother bear attempts to change her posture she produces a chuff call. Polar bear cubs get separated from their mother after attaining one year age (sometimes two years). During this separation moment the mother and a cub will either roar or chuff. Scientists observed that when the mother chuffs the cubs actively respond to her call by coming nearer to her. When do Male Polar Bears produce a Chuffing Sound? The adult males go away and live a solitary life after mating but when the same male returns to the female (after 2 years) the entire family i.e. mother, father, and cubs begin to chuff. Observation suggests that males utter a chuffing sound when they copulate. Alongside chuffing they also moan during copulation. What do Baby Polar Bears Sound Like? Polar bear cubs are thought to utter a unique humming sound but they also chuckle during nursing. They also speak right after the birth but the vocalization is not so clear.